Skyline of San Francisco with the Transamerica Pyramid, as seen from Alcatraz Island. 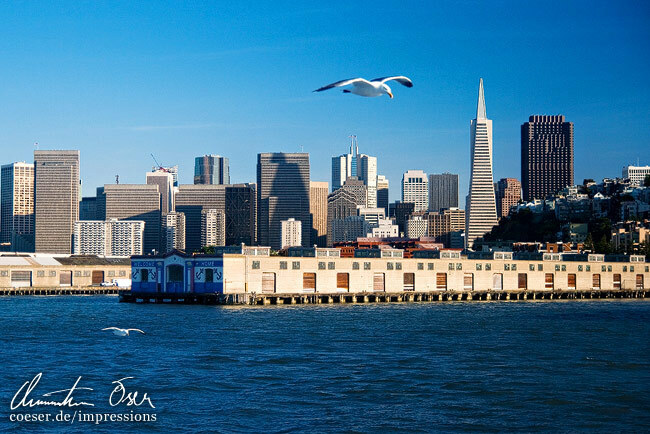 Skyline von San Francisco mit der Transamerica Pyramid, Sicht aus Alcatraz Island. The main pillars of the Golden Gate Bridge. 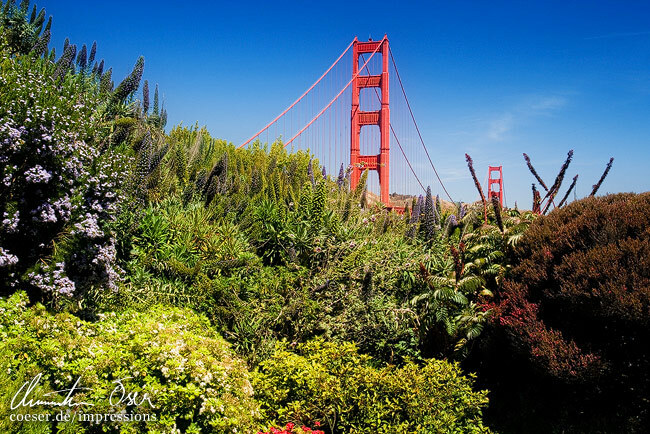 Die Hauptpfeiler der Golden Gate Bridge in San Francisco. 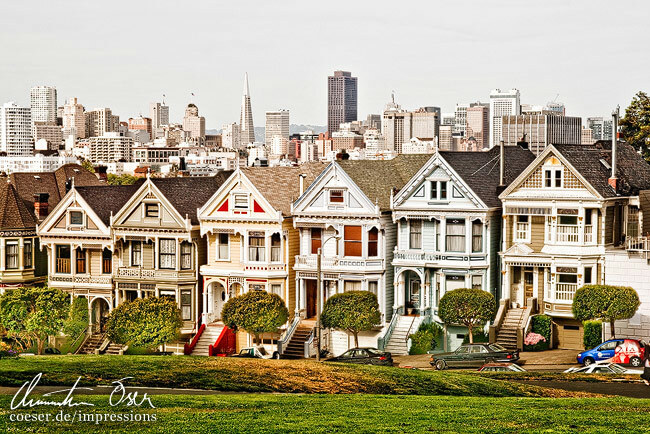 The "Painted Ladies" buildings at Alamo Square and the skyline in the background. Die "Painted Ladies"-Häuser am Alamo Square und die Skyline im Hintergrund. 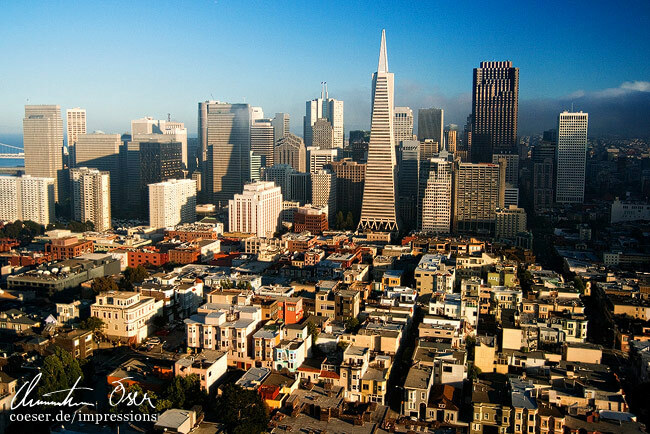 The skyline of San Francisco as seen from the observation deck of the Coit Tower. Skyline von San Francisco von der Aussichtsplattform des Coit Towers aus gesehen. 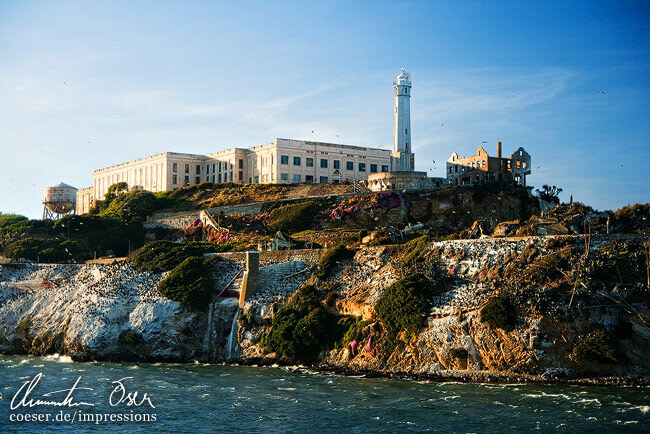 Alcatraz Island ("The Rock") in the San Francisco Bay. Alcatraz Island ("The Rock") in der San Francisco Bay. 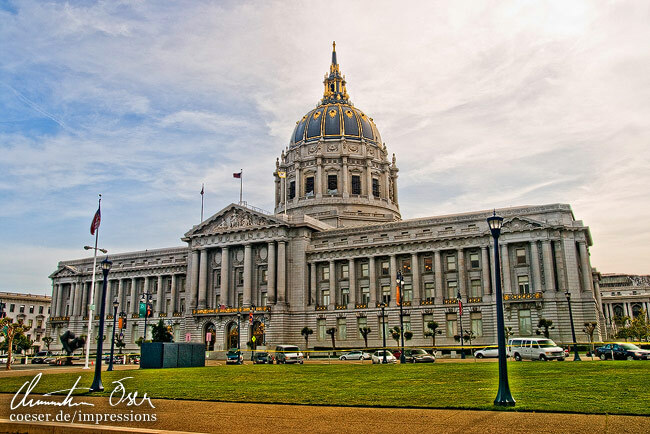 The City Hall of San Francisco. Die City Hall ist das Rathaus von San Francisco. 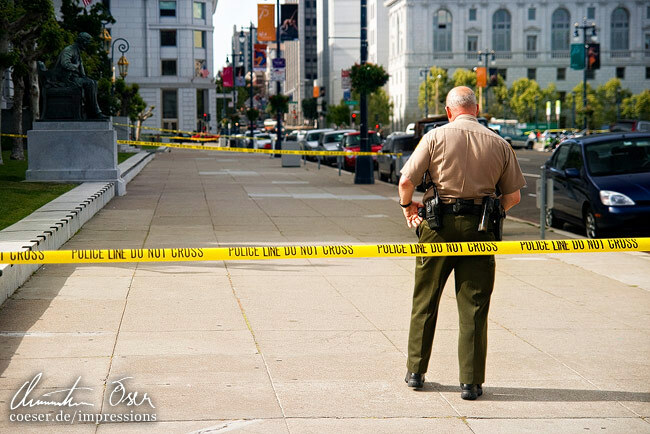 The area in front of the City Hall is blocked off by a police officer. Die Zone vor dem Rathaus (City Hall) ist durch einen Polizisten abgesperrt worden. 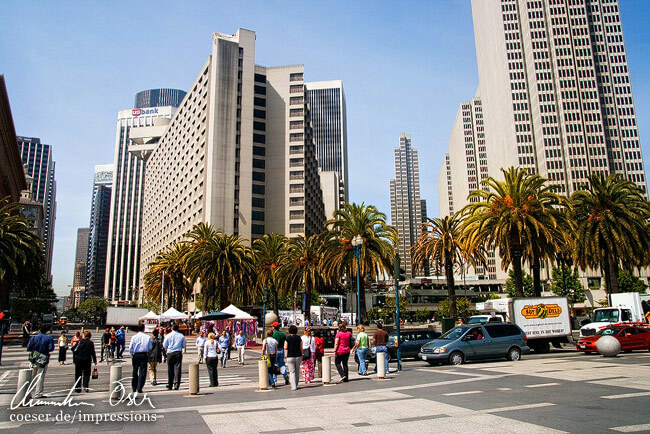 Looking on some high-rise buildings as seen from the Embarcadero Ferry Terminal‎. Blick auf Hochäuser vom Embarcadero Fähren-Terminal‎ aus gesehen. 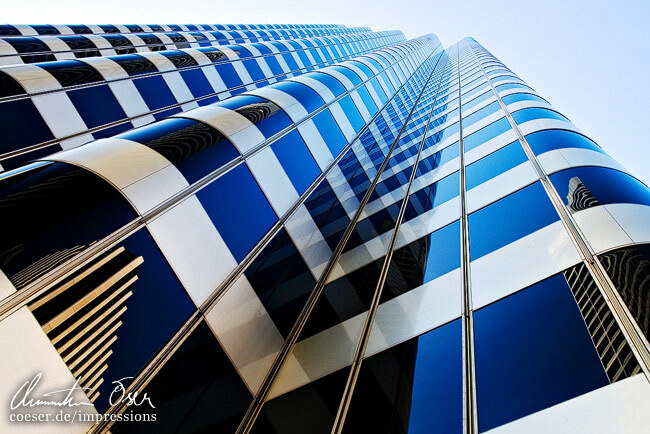 Modern architecture at the Market Street. Moderne Architektur in der Market Street. 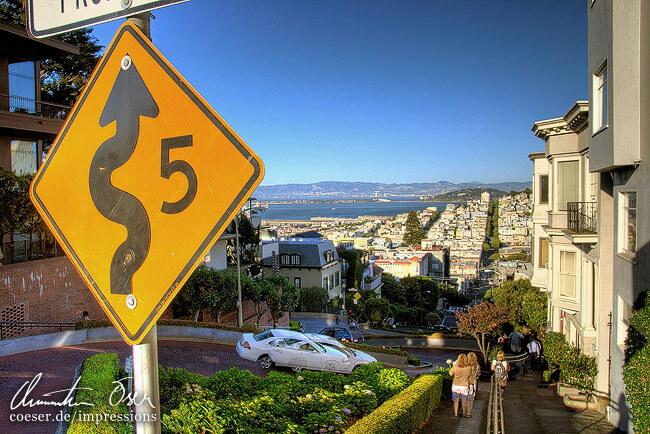 Looking down the eight sharp turns of the Lombard Street. Blick nach unten auf die acht scharfen Kurven der Lombard Street.